Totoro week continues with this Totoro jalapeño grilled cheese! Be sure to check out Lyndsay’s Totoro cake tutorial & Catbus tutorial and my Totoro apple pie pancakes & Totoro black sesame donuts! I’m ending off Totoro week with a Totoro grilled cheese! He’s savoury, he’s spicy, he’s grilled to perfection. I had the hardest time figuring out what his signature white belly would be made of, but when I came across half a wheel of brie in my cheese drawer (yes, I have a cheese drawer) it was like the Totoro stars aligned. A creamy tummy of brie and little seaweed eyes – how could you not want to love (eat) him? This guy is super adorable, but since insides matter too, you better believe he’s filled with the good stuff! A combo of shredded pepper-jack, cheddar, and sliced jalapeños make this a grilled cheese you’ll want to make, even if you don’t have the extra time to cut out tiny seaweed eyeballs. To be honest though, the seaweed bits were my favourite parts. They added an extra layer of crunch and umami. It was so good that I’m going to be experimenting with seaweed grilled cheese in the near future. What do you guys think? Seaweed and cheese: yay or nay? an extra spooky cut up totoro, just for halloween! Heat up a pan on medium-low heat. Butter one slice of bread and place in the pan butter-side down. Top with the shredded cheese and sliced jalapeños. Butter the other slice of bread and place on top of the cheese, butter-side facing out. Cook slowly on medium-low heat until golden brown and toasty. Most of your cheese should be melted when it’s time to flip. Carefully flip your sandwich and continue grilling. The second-side grills a bit faster, so turn the heat down to low and keep a close eye on it. When perfect, remove from the pan, slice into your desired shapes and enjoy hot! 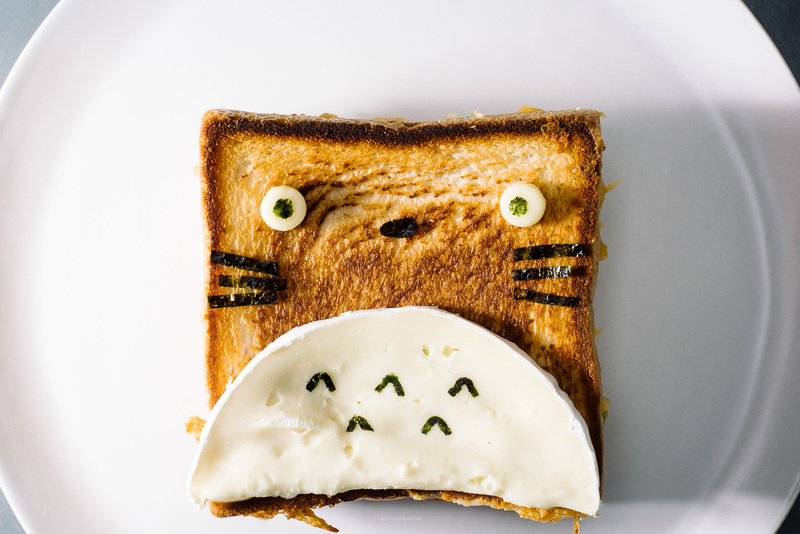 If making a Totoro grilled cheese, prepare the Totoro parts before starting to grill your cheese. You’ll need: brie and seaweed. Cut the seaweed into two tiny pupils, an oval nose, straight whiskers and v-shaped whiskers. To shape the brie, you’ll need to cut a wheel of brie in half and then cut a thin slice so that you have have a slice of brie that is a half circle shape. It’s best to do this when the brie is super cold from the fridge. Make sure you have a sharp knife as well. For the white parts of Totoro’s eyes, take a small slice of brie and use a round cutter (I used a new bubble tea straw) to cut out two rounds. 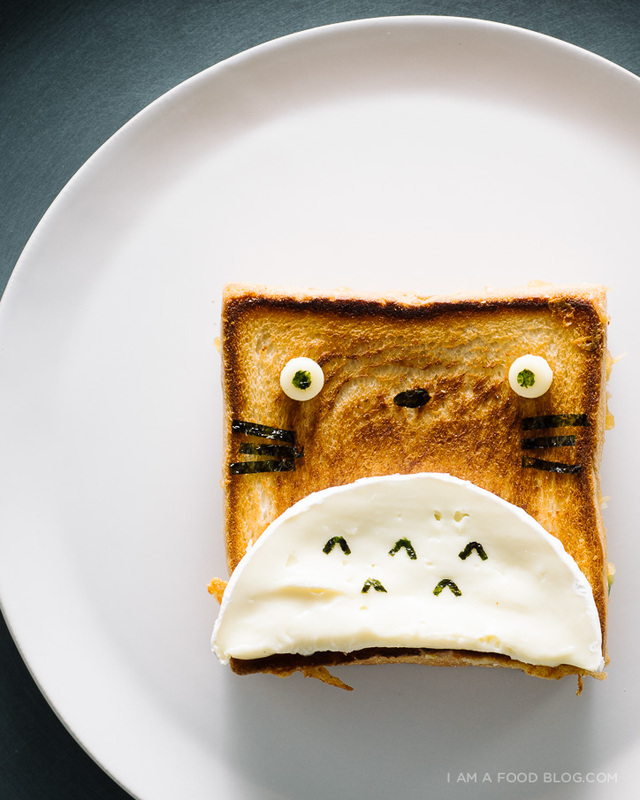 After you flip your grilled cheese, add on Totoro’s features and enjoy! I know you do not need any more cuteness here but I think when someone does a totoro ice cream cone or creme burlee my totoro party will be complete! So cute! Looks delish too Stephanie! You could have a whole blog on fun Totoro recipes. I’m LOVING all of them!! KAWAIIIIIIIIII! holy crap, steph!! 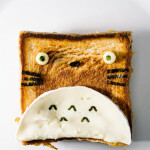 i love love love this crispy crunchy super kawaii TOTORO grilled cheese! mmmm he looks so yummy! that GIF is so good!! only if we can call it cheeseweed. The hacked up version is my favorite, bwahaha. Just kidding. Looks ahhmazing. I love this little Totoro guy! Also, anything with jalapeños fits my bill for a good meal, seaweed or not! You are so creative. The Totoros keep getting better and better!! This is so adorable !!!! I need to try it, you’re very talented. I love cheese and especially jalapeños :) I will definitely try to do this !!! yay to the seaweed and cheese! It is so cute and unique. It is so delicious too. Yum!! This is definitely something I will be trying while I am home from college for break! 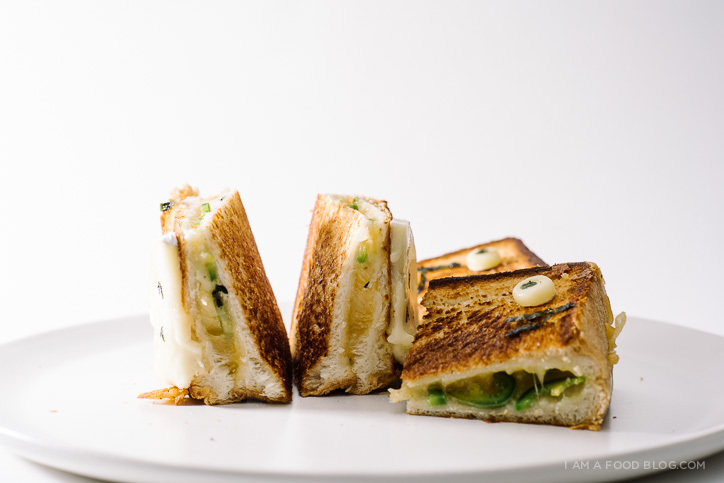 I love grilled cheese and I love jalapenos- perfect.